Baking is not usually my strong suit but from the reaction I received from my "recipe guinea pig" I figure this is defenitely a success! He loved it so much I had to stop him from going nuts and having a 4th slice! 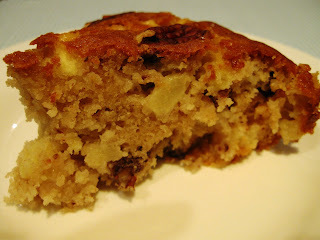 - Add sugar, flour, cinnamon, bicarbonate of soda, salt and vanilla extract. Mix well. 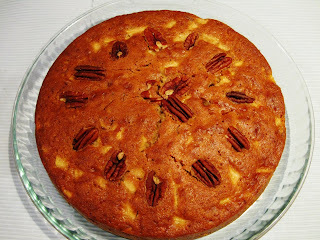 - Pour cake mixture into the cake tin and place whole pecan nuts on top. Enjoy with a nice cold glass of milk. Go nuts! What a gorgeous looking cake that is! I cannot say I am surprised at your boyfriend going back for more. I wouldn't think that cake would last long in any household!